Are you just starting out and wonder where the heck we score all of our amazing deals? 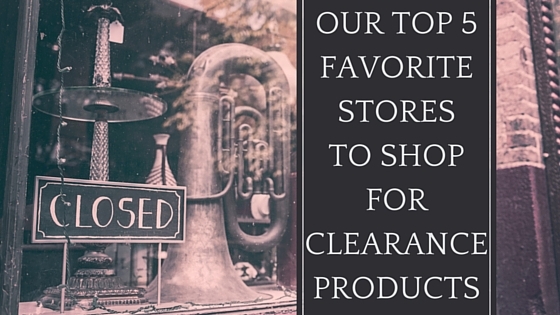 Look no further, because I am going to tell you what our top 5 favorite stores are. Not only that, I’ll give you some insight as to what to look for when you decide to hit these retailers up yourself. We love the good ole’ Depot and we find a close affinity to it, as it is the place where we bought our first Retail Arbitrage product. Home Depot is a solid Retail Arbitrage option, because they have a lot of big ticket items, and sometimes overwhelming amounts of merchandise. But for those willing to spend a little time digging you can find clearance gems. At Home Depot, typically all of the store’s clearance product will be on endcaps. While most stores make the clearance endcaps noticeable, placing them in the middle aisle of the store, it is not uncommon for them to be in a more discrete location like the very back aisle. Also, you can sometimes find that they will build little carts and place them directly in the aisle. Overall, you’ll spot anywhere from 2-4 clearance endcaps in stores. These endcaps will usually be adorned with a large clearance sign on the front and 2 clearance banners on the sides, and it will be painted some hideous shade of yellow. Regardless, you should always keep your eyes peeled for yellow stickers. This indicates that the product is on clearance, and means you should take a closer look. Because you never know, there could be a straggler in one of the aisles. “Expect More, Pay Less.” Other than the fact that Target typically has a Starbucks where we can get a couple of coffees for our ventures, we love Target because of its bounty. We’ve scored big at Target with their toys & games and beauty products. (Free Advice: Legos are a hit!) So don’t miss out on those aisles! Endcaps at Target are more eloquent looking with a nice red “Clearance” sign overhead. They are typically in the same place in each store, unlike Home Depot and Wal-Mart. Like Wal-Mart, we often turn to the back of the electronics aisles but have found some big wins in Beauty/Health & Personal Care. However, good products can often can be found in the run of full-price items. You’ll be able to spot them with their little red tags. Clearance tags at Target come in two forms. On the shelf, you will see a red label with “Clearance” written in white. On the box, the clearance label will be striped: red/white/red. Reminds me of the Austrian flag. Just note, the clearance price will be on the box, not on the shelf. “Always Low Prices.” Yes, and keep them on rolling back for us retail arbitrageurs. 😉 Wal-Mart is the behemoth of retail. They really hit every Amazon category, and that’s why it is a great place to buy. Again, look for those endcaps. Go to the back of the aisle and track down the clearance product. Wal-Mart doesn’t call as much attention to the clearance products as Home Depot. But they do often have a yellow clearance sign overhead, or can just simply have a miscellaneous shelf with a mish-mosh of clearance product on there. When we go to Wal-Mart, we make it a routine to go directly to the back of the electronics section. We seem to always find Wal-Mart’s most expansive clearance section back there, and it tends to yield the best product. While Walgreens is the United State’s largest drug retailing chain, the product offering does not end with drugs. Toys & Games, Beauty, Health & Personal Care and, oh dare I say it, the beloved As Seen On TV section. Even though you can find great deals on the clearance rack, you’ll want to keep your eyes peeled for the product that is worked into the aisles throughout the store. On the clearance rack, you’ll often find that the product is priced with a round, yellow sticker with the dollar amount. That indicates that management just wants this product the hell out of their store. For product that recently went on clearance, or hasn’t had the opportunity to make its way to the clearance rack, you can pinpoint them with their can’t-miss orange tags. Probably one of the best parts of Walgreens is there choice of unmistakable orange clearance colors. Oh, how it makes the shopping experience so much better. We started with a Home Improvement store, and we’ll end with one too. The major difference between Lowe’ and Home Depot, in terms of Retail Arbitrage, is that Lowe’s has a lot less inventory of any particular product. That’s why most contractors prefer Depot. Meaning, that Lowe’s will only have 2 power tools in stock at one time, while Depot will have 2 on the shelf and 10 more in the overhead. What does that mean for us? Well, when something goes on clearance at Lowe’s, it will sell out much quicker than something at Depot. So, product can be scarce here. But that doesn’t mean you can’t strike some clearance gold! Although I encourage to always check the back of the aisles for clearance endcaps, it can be hit or miss at Lowe’s. Some of our biggest finds have simply been from scouring the aisles and spotting product that is still merchandised on the shelf. You will notice that Lowe’s clearance labels will either be white and yellow (for larger price labels), or completely yellow (for smaller price labels). But, they can often trick you because Lowe’s uses the same label format for their “New Lower Price” and “Contractor Bulk Price” labels. So you might walk into the aisle and think, “holy shnikees, there’s a lot of stuff on clearance.” But in reality, most of that is just for a 90-day sale. All in all, it never hurts to investigate. You just have to get out and do it! So, which store are you going to hit first?